Double action AC props | Building Equipment | Amadio & C.
The push and pull props derive from class B, taking all their security features and load capacity. By working both in compression and in traction, they resolve, in an economical way, all problems of implementation of the vertical forming and of the wood panels, then ensuring their stability during concrete pouring. They are also useful in the field of prefabrication, by stabilizing the vertical walls during assembly. Max extension: 2600 mm – 5100 mm (8’6″-16’8″). Swiveled bases with rounded shape: Safer to move and easier to mount due to the oval hole. Hand safety system: When the prop is closed there is a minimum of 10 cm of free length of the internal tube to avoid the involuntary crushing of the operator hand. Holes punched: Warranty the absence of processing burrs, ensuring perfect functionality even after many uses. External Thread: It is made by process rolling, so there is no removal of material. It is distinguished for the abundant length, increasing in this way the field of fine regulation and for the two self cleaning steel nuts. Internal (or covered) thread: Obtained by rolling without the removing of material, and latter welded to the outer tube, obtaining in this way higher strength and functionality. 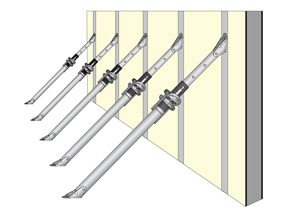 Steel Sleeve: The small tube at the top allow the Push/Pull effect and at the same time protects the internal thread, while the deformation of the bottom prevents the accidental disengagement from the thread. Copyright © 2019 Amadio & C. - All Rights Reserved.